Supreme Technology is the Most Elegant Technology. In the summer of 1990, I spent a long period shut away in a room known as “The Attic” in the Vienna State Opera. 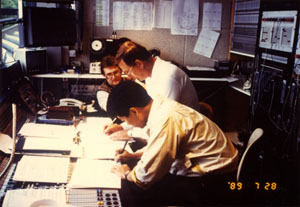 I was putting the finishing touches on a two-year project to construct the “World’s First Digitally Processed Opera Sound System.” Our clients on this project were the “tone meisters”, the opera house sound directors. At the time, my work in Vienna formed part of the development of sound systems with applied digital signal processing (DSP) at TOA Corporation. However, applying DSP technology to the sound systems was not a company decision, but a theme that I had been thinking for a long time. Despite having the discretion and budget to do as I pleased, everything had to be started from scratch. 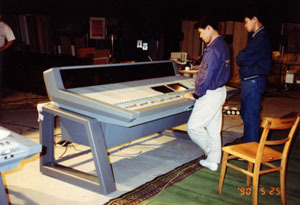 After spending two years forming a small development team and holding discussions with a number of tone meisters, the theater-model console “ix-9000” was completed. Due to this unique technology, the development was achieved by solving numerous problems that had to be overcome one at a time. The impetus that spurred me on was the notion that the mixing console, which was capable of digitally processing every acoustic application through all the input and output, was the most elegant technology and solution. On September 1, 1990, this notion was formed at the staging of “Don Carlos” where the ix-9000 received high acclaim as a core system of the Vienna State Opera. From here onwards, I went on to develop the multi-purpose ix-Series, which has been delivered to numerous establishments, including radio and TV stations throughout Japan. My thoughts always turn to the benefits of digital technology and I’ve come to consider it is the “humanizing of technology”. Unlike analog processing, where it is essential to control the link between electrical and mechanical, digital processing makes it possible to do away with this kinds of limitations, completely. Similar to the way in which computer-aided, fly-by-wire (controlled flight) aircraft have evolved dramatically, the application of DSP technology to acoustic instruments makes it possible to attain a degree of freedom that is in a completely different dimension to analog signal processing. In every sphere of theater, broadcasting stations, recording studios, and consumer audio, digital technology serves humans and the art, the most sublime forms of human expression genuinely. The “ix-9000” full digital console carried into “The Attic” at the Vienna State Opera. In 2010, after leaving my representative position at Bose K.K., I established a new company: J.TESORI. My purpose was to sublimate the Japanese-style technology development and global style marketing that I had experienced thus far and to furthermore produce a new “monozukuri” system that could not be achieved by either of these established systems. Creativity which is necessary for engineer, team leadership to realize these ideas, and marketing ability which creates new needs and ties in product development to the market directly. If any of these components are missing, it is not possible to create a project that carries with it a strong message. This is my conclusion through the experiences working at the forefront of professional audio in Japan, Europe, and America. 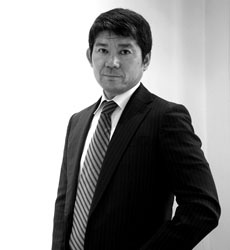 The goal of J.TESORI is to establish next-generation technology and new “monozukuri” systems. - 03/2010 General Manager of Bose K.K. - 03/2008 Joined Bose K.K. as Technical Advisor. Developed professional digital signal processing systems and consumer speaker systems. Led technical development and responsible for managing marketing and sales sections. - 03/2001 Developed professional digital audio systems at TOA Corporation. Introduced “SAORI”, the worlds’ first integrated audio digital signal processor and “ix series” full digital console. Led the project to fully digitize of sound system in Vienna State Opera, console in NHK, and so on. Held pioneering roles of DSP technology in the audio field through development of professional digital audio systems. 03/1980 Received a Master Degree in Communication Design Science from Kyusyu Institute of Design (current Kyusyu University). 03/1978 Received a Bachelor’s Degree in Acoustic Design from Kyusyu Institute of Design. 01/1955 Born in Fukuoka, Japan. 2010 - J.TESORI corporation All Rights Reserved.